Chances are--- even if you're only just venturing into more natural living and particularly natural beauty--- you've heard of this must have beauty wonder. It can be found in many products from masks to face washes and more. 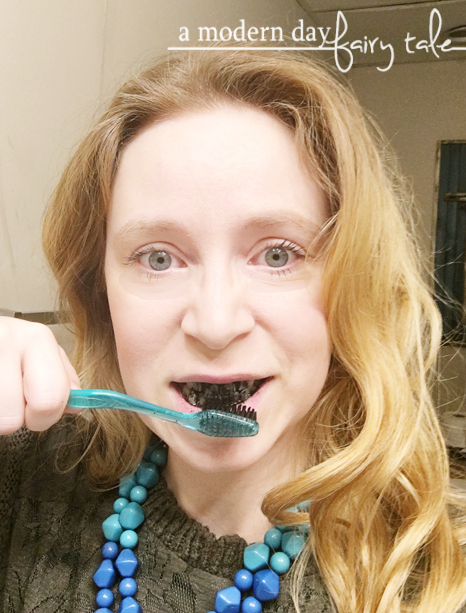 But today, I want to talk about my personal favorite way to use activated charcoal: to whiten teeth. I know, I know... charcoal? In your mouth? A black toothpaste to whiten teeth? This doesn't make any sense! It cannot possibly work! Trust me, I feel you! I felt the same way too. Then I tried it. Now, it's no secret I love my coffee and this among other things led to some slight yellowing of my teeth that I must admit, I am just not comfortable with. From whitening trays to toothpastes--- even oil pulling, I had tried various methods out there to brighten my smile and give me more confidence with my teeth with no luck. So I thought... why not? I ordered myself some charcoal toothpaste and gave it a go. After just one use I could actually see an improvement. The more I used it, the better it seemed to be. I'd never gotten such quick results with any other method, that's for sure. Still, it wasn't without it's downfalls. First of all, the toothpaste that I first tried tasted awful... yes, it worked, but the taste... yuck! Still I liked the results, so I thought I'd try an activated charcoal tooth powder instead. You simply dip your brush in the powder, brush, rinse then follow up with your toothpaste of choice. Easy enough. But I found that the powder that I'd purchased was a little rough on my gums. I have sensitive gums anyway, but the abrasive powder was just too much. Eeek! There had to be a better option. 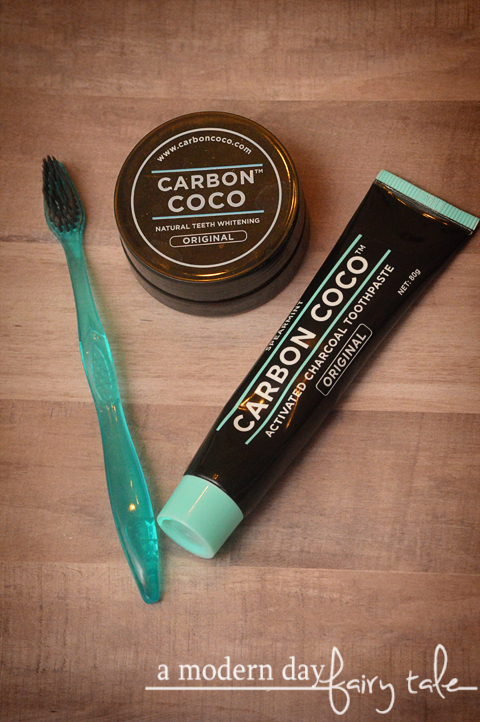 Made from 100% certified organic coconut shell charcoal, Carbon Coco not only brightens your smile, but also improves your overall mouth health.Our medical grade activated charcoal powder removes toxins, stains, and plaque from your teeth through a process called adsorption, in which activated charcoal binds with these particles and flushes them out of your teeth and mouth.The super finely milled polish won’t damage your enamel or gums and also contains bentonite clay, a natural ingredient that helps remineralise teeth plus a hint of lemon myrtle, which has gentle and non-acidic antibacterial properties. Wet your toothbrush. The kit included a toothbrush with bamboo bristles that I must say is the softest toothbrush I've ever used. For sensitive gums, this is a must. Dip your toothbrush in the powder. Start brushing. Now I must admit, this is going to look insane! Your mouth will turn black and you might just find yourself wondering if you've lost your mind. Keep on brushing. Now, use the toothbrush, just as you would a regular toothpaste. Now, like I said, using this style of product was not new to me... but my experience using Carbon Coco was completely different than that from other products. First up, the polish. As I said, others I'd tried in the past were very abrasive and could be a little painful. I do know that this is in large part due to my sensitive gums, but still it made for a less than pleasant experience. Carbon Coco was certainly less abrasive. It still did the job, but felt much more gentle on my gums and teeth. I'm not sure if its a finer powder or if its the added bentonite clay... or maybe just the soft toothbrush included. Either way, I loved it. Next, the tooth paste. It claimed to have a spearmint taste, but having tried others that claimed to have better flavors that... well, fell short, I was skeptical. But I was pleasantly surprised. It actually did offer a very refreshing spearmint flavor. I loved it. I was also surprised that as I started brushing, the black paste actually creates a white foam--- which is not typical in my previous experience. Truly interesting to watch, and much more pleasant than that crazy black foam. The results? I honestly am again at a loss for how this stuff works, but I know it does. Yes, there is some whitening--- not bright white, but an improvement--- but beyond that my mouth just FEELS better. My teeth feel cleaner, my breath fresher... you get the idea! Have you tried activated charcoal? Did you love it? Hate it? I'd love to hear your personal experiences in the comments below. I haven't heard about this. I have to tell my husband, he is looking for something like this. I've heard coconut oil is also good for teeth. I haven't tried either but I'm curious to, esp since i have tea teeth.